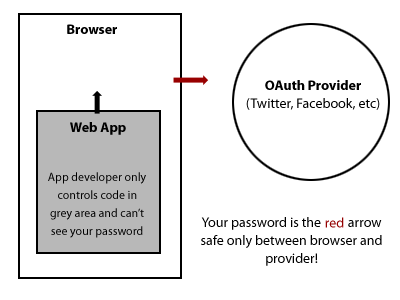 In this post, I’m going to explain how and why OAuth in native mobile apps does not secure your password, and why you should still be wary when logging into Facebook/Twitter/Google/anything through any app except their respective official native mobile apps. I’m writing this post to expose the still weak security for single sign on services in native mobile apps. I am not providing any source code, though after reading this post I’m sure you’ll agree that eavesdropping on an OAuth transaction in a native mobile app is extremely easy even for a novice programmer. The purpose of Oauth is to let application developers use Twitter/Facebook/anysite’s login mechanism, all while keeping the password 100% secret from the application developer. In this world, if the application turns out to be an untrusted malicious application, all the user needs to do is turn off access from that application on Twitter/Facebook/anysite’s settings page. However, native mobile application developers are still able to access (steal) your password even when using OAuth for login, all 100% undetected. This means that for native mobile apps, using OAuth is not any more secure than using Basic Auth, and Twitter’s API change from Basic Auth to OAuth does nothing to protect user’s passwords from malicious application developers. To be clear, this affects every OAuth implementation in native mobile apps, across iOS, Android, and [I believe] Windows 7. As our first example, let’s take a look at web apps – this is true for both mobile web apps and desktop web apps. OAuth succeeds in protecting the user’s login information because the web browser is a 100% trusted agent and ensures that the application code on the web app’s domain name cannot access any information on the OAuth providers domain name. This is called Same Origin Policy. Haiti Aid Map: Who is Doing What, Where. Looks like I’m going to have to take that book off my to be read shelf and read it.